Harley Quinn Red, White and Black statues are based on art from the comics industry's top creators and re-create their vision of the red-hot villain in vivid 3-D detail. This entry into the Harley Quinn Red, White, and Black line drew inspiration from Frank Cho's variant cover for Harley Quinn #50. One can see a bit of panic in Harley's eyes as she scrambles to rid herself of the bomb and, in the process, save the ducks adorning her custom nameplate stand. This piece is a great addition to the collection of anyone who loves Harley, old-timey bombs and street-crossing waterfowl. 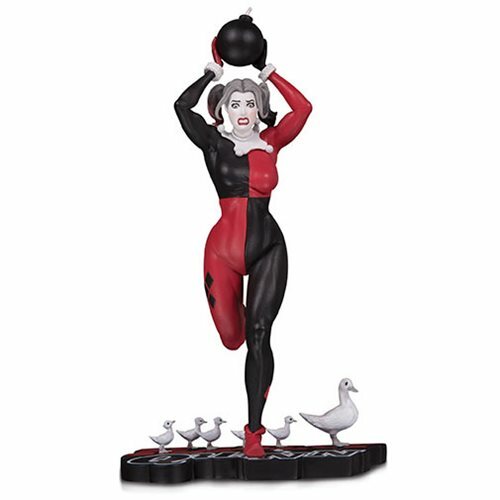 The Harley Quinn Red White and Black Statue by Frank Cho Statue is a limited edition of 5,000 pieces and comes individually numbered. The statue stands about 8 1/2-inches tall. Designed by Frank Cho and sculpted by Alejandro Pereira.